Have you ever heard of Fiverr? Fiverr is an amazing website where you can get all sorts of services from all sorts of professionals. It’s different from other freelancing platforms because prices start at only $5. You can find a logo designer, have someone sing “Happy Birthday” for your friend from a clifftop, get your SEO done, make videos, do voiceovers – the list goes on. And now you can order a custom painting from me through Fiverr at heavily discounted prices. 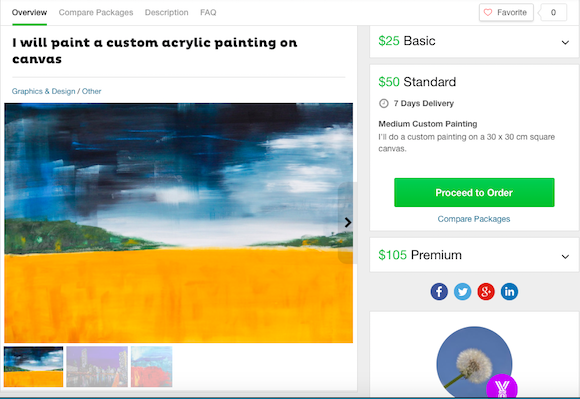 Why Order a Custom Painting on Fiverr? First of all, let me tell you that this Fiverr Gig of mine will only be available for a limited time, so view it as a promo offer. Basically, I want to get the word out and that’s why I’m prepared to paint custom paintings so much cheaper than I usually do. The shipping charges are also low. So if you want to order a 100% unique work done just for you, head over to Fiverr. Another reason to order from Fiverr is your and my safety. Fiverr guarantees a safe transaction and the seller (me) doesn’t get any money before the buyer is satisfied with the order. Your money stays safe until you see the picture of the painting and accept it. As a seller, I’m also protected because the money is reserved by the system when you place your order. So I know that I’ll get paid for my work. What Do You Offer on Fiverr?